Fungal pathogens affect a wide variety of hosts, such as human beings, plants, animals, and insects. The course of infection relies on the virulence grade of the fungus and the strength of the defense mechanisms of the host. Virulence factors are closely related to the cell surface; cell wall proteins have a crucial role in adhesion, hyphal development, hydrophobicity, biofilm formation, immunomodulation and surface variation. The enzymes involved in cell wall biosynthesis are not proper virulence factors, but they are necessary for cell function. The deletion of the genes encoding those enzymes often results in an attenuation of virulence. Secreted proteins and cell wall proteins are modified with sugar residues through the N- and O- glycosylation pathways. A set of glycosidases and glycosyltransferases from the Endoplasmic Reticulum and Golgi bodies determine the outcome of the protein. Proper protein glycosylation is important for folding, localization and protein function. In fungi, the glycoproteins are particularly enriched with mannose moieties. In this review, the role of mannosyltransferases from the Pmt, Ktr/Mnt, Mnn and Och1families for the full development of fungal virulence is summarized and discussed. Keywords: Mannosyltransferases, N-glycosylation, fitness-attribute, O-glycosylation, pathogenic-fungus, virulence. Keywords:Mannosyltransferases, N-glycosylation, fitness-attribute, O-glycosylation, pathogenic-fungus, virulence. Abstract:Fungal pathogens affect a wide variety of hosts, such as human beings, plants, animals, and insects. The course of infection relies on the virulence grade of the fungus and the strength of the defense mechanisms of the host. Virulence factors are closely related to the cell surface; cell wall proteins have a crucial role in adhesion, hyphal development, hydrophobicity, biofilm formation, immunomodulation and surface variation. The enzymes involved in cell wall biosynthesis are not proper virulence factors, but they are necessary for cell function. The deletion of the genes encoding those enzymes often results in an attenuation of virulence. Secreted proteins and cell wall proteins are modified with sugar residues through the N- and O- glycosylation pathways. A set of glycosidases and glycosyltransferases from the Endoplasmic Reticulum and Golgi bodies determine the outcome of the protein. Proper protein glycosylation is important for folding, localization and protein function. In fungi, the glycoproteins are particularly enriched with mannose moieties. 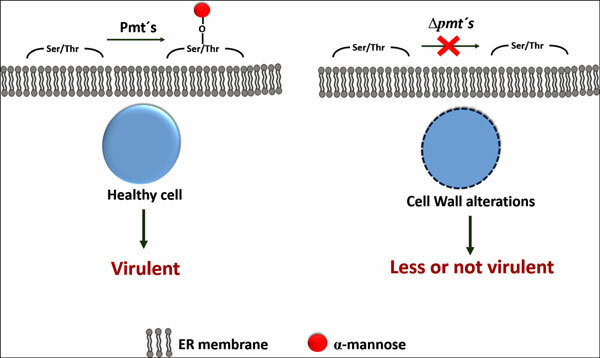 In this review, the role of mannosyltransferases from the Pmt, Ktr/Mnt, Mnn and Och1families for the full development of fungal virulence is summarized and discussed.